It's celebration week in our house (new job for me & a trip away as a congrats pressie from The Hubs), so I decided to share the love and let one of you lucky lot get your hands on this amazing prize. 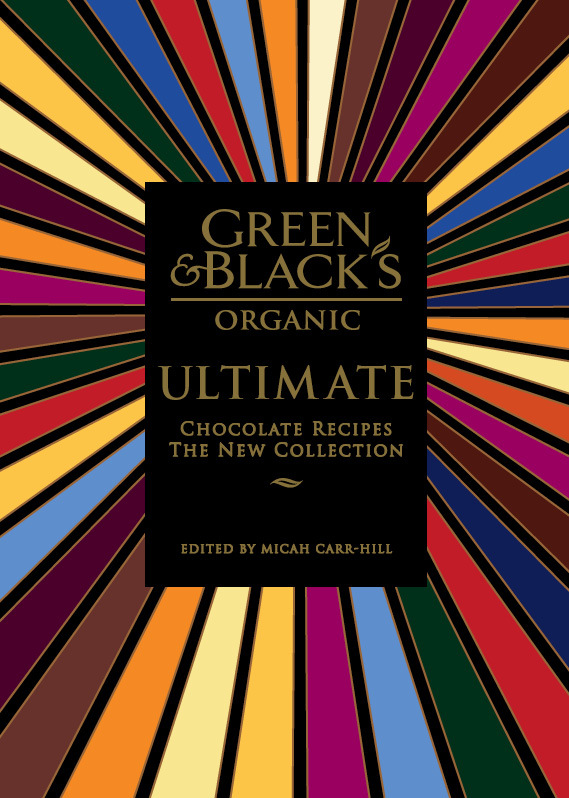 Courtesy of the incredibly lovely people at Green and Black's, I have a copy of their brand new, super duper, covetable, droolable and quite basically brilliant new book Ultimate Chocolate Recipes to give away. This is not just any book, this is crammed full of amazing recipes using my favourite chocolate in the whole wide world ever. With a greedy eye on baking, there are tempting recipes for cakes and cookies, cupcakes and cheesecakes, puddings and pies, as well as inspirational ideas for dinner-party desserts, ice creams and what to make for little sweets and treats. And for those who are watching their weight, or who have allergies, there are some naughty but nice recipes for you too. Not only have Green and Black's released this divine book, but they're also running two fantastic competitions on their special website where they're recruiting a Taste Assistant and a Taste Panel. You can find out more at their Facebook page or if you tweet, please follow them. What chocolate dessert would you have to round off your last meal? Leave a comment below telling me all about it. My decision is final, so there! Chocolate brownies with a sprinkling of fresh raspberries through them! Divine and so yummy! Made them recently using G & B's. In my haste I forgot to say congrats again on the job front and eh, your hair is looking only fab today. ..ahem..I have chocolate recipe that I've been carrying around in my glasses case that, judging by the yellowyness of the paper has been aging for quite some time. I would quite like someone to make it for me b4 departing to what I can only assume will be a chocolate covered paradise. It's called Hot Chocolate Pudding with Raspberries. My hubby is the chef in our house, & altho' he is a feeder :) he's not really a dessert maker, so instead of being a home-made dish my last meal dessert would be the black and white chocolate tiffin/cookie slice thingy from the Jarrow Cafe at Castlecomer Discovery park in Co. Kilkenny. YUM! And YUM! And YUM again!! I realize that not knowing the proper name of the thingy will not probably win me the prize- but I just had to share! Get one if you're in the area- soo tasty. Anyhow, even cover of the cookbook itself looks tasty! I may have to seek it out & give as a present to my ChefHubby! I'd have to go for these warm gooey-centred chocolate puddings served with vanilla ice cream. I've tweaked the recipe slightly to include a ganache centre and actually gotten ramekins since I first made them, but I still use G&B 70% Dark every time. For me it would have to be my grandmother's chocolate ice cream. I know it's not the most chocolatey of desserts, but it is just right to finish off a meal. Although there are many contenders, I'd have to say my favourite chocolate dessert is Trish Deseine's famous gateau. Woohoo, huge congrats again on the job! For me, it would have to be Chocolate Devil's Food Cake from the Hummingbird Bakery YUMMY! Mmmmm... my son is the chocolate fiend in our house and his favourite is Nigella's Dense Chocolate Cake with the choc fudge sauce from River Cottage Family Cookbook and good vanilla ice-cream. Rather like it myself too. Devils food cake. Ya, BRING IT ON! Or Brownies, like really fudgy really chocolatey buttery sugary goodness nyargh drooling amazing. Hmmm, my last meal ... that would mean it has to be extra special. So, anything made with Amedei Chuao. Probably chocolate icecream made following the recipe in The Book of Sweet Things by Murphy's Ice Cream. Chocolate mousse made with a drop of cointreau for good measure! Nice and light and hits the spot - yum!! I'd make a chocolate mousse with beaten egg whites instead of cream and a bit of orange liqueur for a truly delicious cold dessert. Ultimate Chocolate cake recipe on BBC Good Food. Delicious and so rich. Made it for my sister's 18th last year. Good hot or cream, with a dollop of whipped cream or ice cream. Yum! The magic number chosen by Lulu was 15. The winner of the G&*B Ultimate book is Lu - no fix, honest! Hurray!! Me!! Thanks a million, delighted can't wait to get cooking from this - I wonder if there is a chocolate fondant recipe? ?